Trek73: Set Phasers to Obfuscation! A while back, I complained about not being able to find a few games for review around here, one of them being Trek73 by William K. Char, Perry Lee, and Dan Gee. Thankfully, reader Fred Sloniker pointed out the TREK73 Page wherein one can get all sorts of information about the game, as well as downloads for DOS (how I played it), BASIC, Turbo Pascal and more! Now, after spending some time with the game, I finally feel ready to give it a verdict. If you couldn’t tell by the title, I ran into a few…let’s say…roadblocks in my attempt to enjoy this game. See all of those? 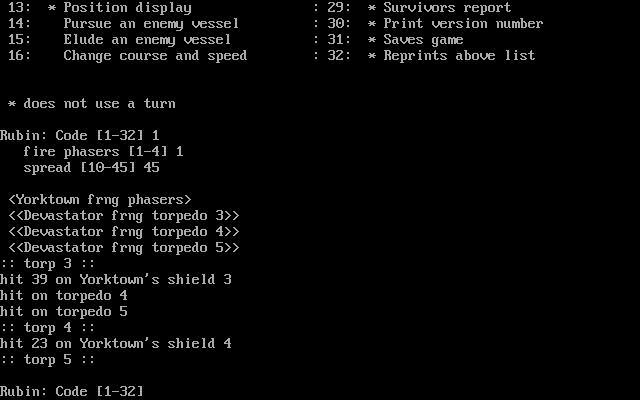 Trek73 has over thirty commands (which are all listed at the TREK73 page linked above), most of which use a turn, but some which don’t, such as checking on phaser or photon torpedo tube status. For the most part however, everything takes a turn, from moving the ship to firing weapons to loading torpedo tubes and so on. Since today’s computers are much, much, muuuuuuuuuch faster than the computers in 1973, these turns go by damned quick, and even with DOSBox slowed down as much as one could muster, the game still went by quite quickly, to the point where an entire match would pass by in mere minutes, leaving me confused and, honestly, someone stung by all the losses. And lose I did, a lot. I didn’t win one match in this game out of the I don’t know how many I played. As soon as a match would begin, I’d spend some initial turns locking phasers and tubes, and loading torpedoes, when all of a sudden bam! Bam! Bam! Dead! Seriously, that’s how just about every match felt. Before I got what felt like even a moment to prepare myself by locking weapons and such, I was being fired upon by weirdly named enemies (which matters in this game!). The Dragonicon? Really? I Have to Type That? To lock all four tubes. But wait, you’re not done. THEN you have to make sure your ship is turned in the right direction so your weapons can fire. This takes first a command to see where the enemy is (which doesn’t take a turn) and then giving an order to change course and speed to intercept (which does). So far you’ve used four turns, all of which the enemy always appear to be already firing weapons and barreling right at you. Now, what happens if you spelled “Dragonicon” wrong? Too bad, you lose a turn. 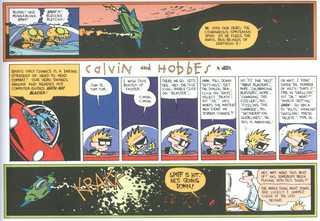 I tell ya, after several rounds of this, I really longed to go back to the relative simplicity of 1971’s Star Trek with its 8-point aiming and navigational scheme. 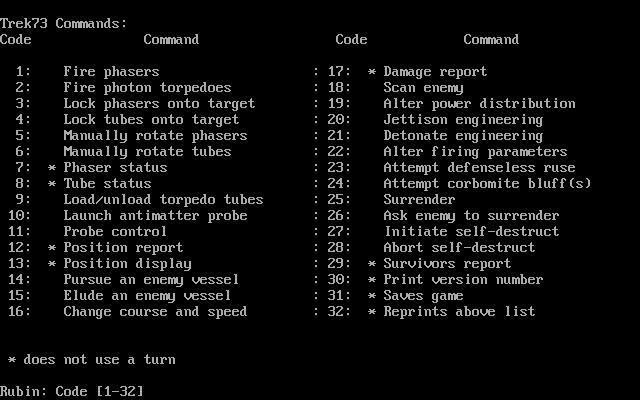 Even after reading the description of the commands at the TREK73 Page, I honestly still had a tough time figuring out how to beat this game, likely through a lack of situational awareness. Even after using various commands to get a bead on where my enemy was, by the time I ordered my ship to either pursue or turn towards the enemy, I was under heavy fire. Again and again this happened, and again I lost. This led to a supremely frustrating experience, I have to say. I guess this is why so many homages to the other Star Trek game exist rather than this one. I can’t say it’s a bad game, really, as it’s truly trying to do something different and unique. I think the problem is that it’s much more a product of its time than the earlier 1971 game, and thus doesn’t translate as well to the brains of gamers today…or at least my brain. I have a lot of patience for space games (and with patience being one of my almost non-existence virtues, that says a lot), and I just had a very hard time wrapping my head around this one. I wanted to enjoy it, because I saw what it was trying to do (i.e. be as immersive as possible, as if you were giving the commands by typing them out), but in the end I ultimately couldn’t. Since the game is free and very tiny, I invite y’all to try it and tell if I’m either wrong as hell or totally right. ;) That’s it for my review of this classic game. I hope you enjoyed it, and I invite you to see all the screenshots I took below. Thanks for reading! First, the DOS version I played doesn’t require you to enter the entire command on one line. You can enter the numeric command, and it’ll prompt you for each part of the command after that. The all-on-one-line format is for when you get familiar enough with the commands that you don’t need to be prompted. Also, you don’t have to type the entire name of the enemy ship — just the first letter is fine. If you’re fighting multiple ships, each one’s name will start with a different letter. Honest! Now for tactics. 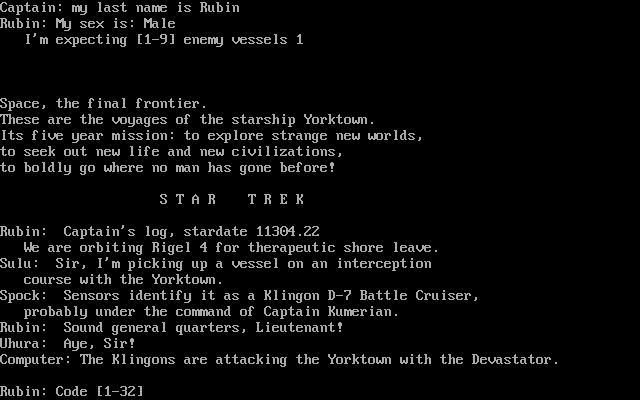 Speaking as someone who played this game a lot (on a teletype terminal) in junior high school, the first thing you want to do is pursue the enemy, but specify a *negative* warp speed, so that you’re backing away from the enemy! This gives you more time to lock and load your weapons, as they’ll have to come up to speed and chase after you. Try warp -4 or -5; that’ll give you some room without using up your fuel too quickly. Now load your torpedoes, lock them on target, lock the phasers as well, and fire your torps. Keep using the position report command (12) to track how far away they are, and 13 to get the visual display (which includes incoming or outgoing torps). As long as they’re still a good distance away, keep reloading and firing torps. Once they get close enough, switch to phasers. Your phaser range is only 1000, but if they’re, say, 1800 away and coming in at warp 11, start firing phasers now because they’ll be way too close by your next turn. When you start feeling comfortable with these basic tactics, try using your phasers to detonate their incoming torps. When the torps look close enough, fire the phasers with a wide spread to make sure you hit the torps. Glad to hear it! Oh, and instead of typing “123456” to refer to all the torpedo tubes, or “1234” for the phasers, you can just type “all” (without the quotation marks). Next story PULSAR: Lost Colony Kickstarter Takes Off!